Legatus Magazine Profiles our Pilgrimages! I was very happy to see the recent Legatus Magazine. The article was entitled "On the Road to Truth: A Look at Faith-based Travel." The article features our Footprints of God Pilgrimages and our partner Corporate Travel. It is a nice picture spread with good information about travel and pilgrimages for Catholics. Click here or on the image to see the article. Legatus is an organization for CEO', business owners, and financial managers. Since the inception of Legatus on May 7, 1987, its mission has been to bring Catholic business leaders and their spouses together in a monthly forum that fosters personal spiritual growth. 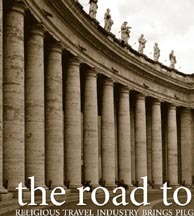 To see all of our pilgrimages, visit our website at www.FootprintsOfGodPilgrimage.com.